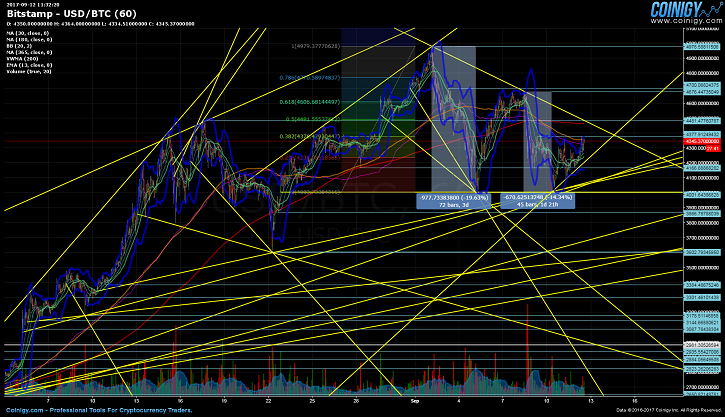 Once again, the $4,001.93 weekly low has not given away to selling pressure. This is the second time a reversal has failed to shatter the weekly support, the first attempt occurring on September 5 (GMT 03:00). The drops are shortening in intensity and decreasing percentage wise, with the first turnabout dragging on for 3 days, and price retracting by almost 20%. The next subsequent, and latest 15% fallback was concluded in less than 2 days. With the new highs in bitcoin, altcoins have considerably constricted in their flow and movement. This has resulted in diminishing growth rates across the board, percentage wise at least, especially when compared to pre-summer price levels. Despite it all, ethereum is at $300, ethereum classic is a bit above $15, while litecoin is holding at $70. Even bitcoin cash has managed to endure, staying strong at $567, which is a bit below the Fibonacci 0.5 line ($637.05), with the ongoing BCC trading range remaining relatively predictable. Volume on Bitstamp is showing to be stable at the moment. 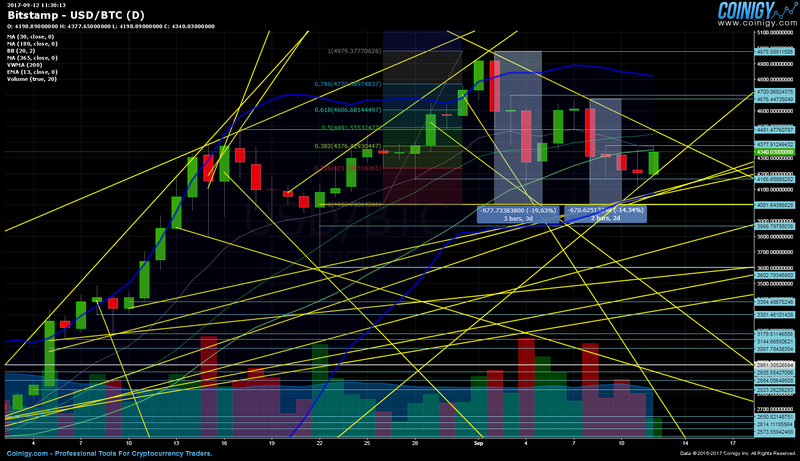 Intersecting trend lines reaffirm the $4,001.93 weekly low as a firm point of interest. Primary supports stand out at the $4,001.93 weekly low, $3,600 September monthly low, and at the June $2,981.30 monthly high. Secondary supports are at $4,166.68, $3,866.79, $3,384.48, $3,301.46, $3,178.51, $3,144.66, and at $3,087.78. The $4,679.97 weekly high is emerging as an important and crucial resistance level. 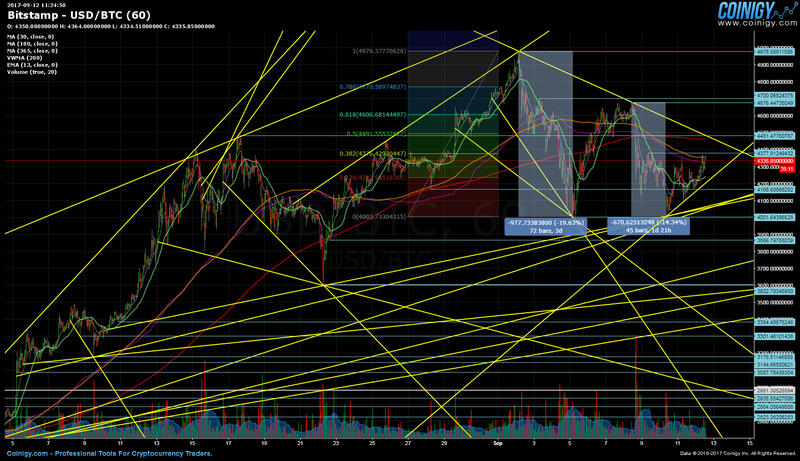 However, both $4,378.38 and $4,481.47 are going to have to be conquered beforehand first. $4,676.44 and $4,700.06 are consequently, in close proximity after that, with the $4,979.9 all-time high serving as the final route destination. 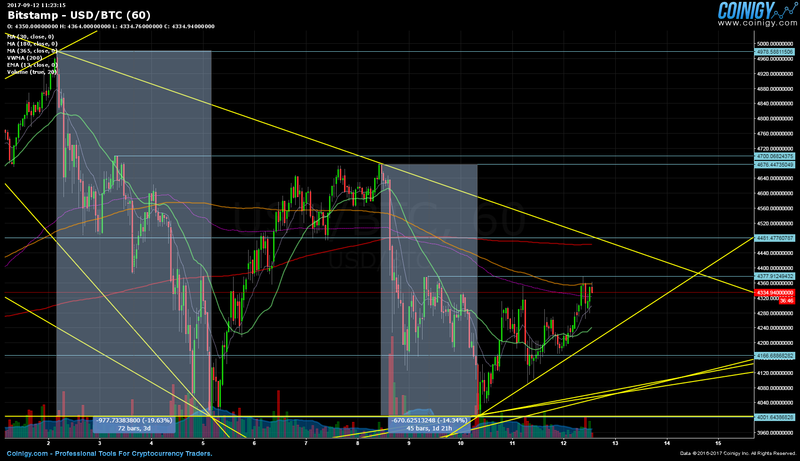 The 0.382 fib ($4,376.42) lines up rather nicely with the $4,377.91 resistance. The 0.5 fib ($4,491.55) is close, but still overshoots the $4,481.47 September all-time high. The remaining support and resistance levels do not overlap, and thus far, bitcoin has not exceeded the 0.382 Fibonacci level. A minor pullback to the 0.236 fib ($4,233.98) is possible as well, if the current sideways trading ends up being prolonged. Bollinger bands on the daily have calmed since last week, a more modest gap has also formed, and seems to be contracting, so lower volatility is to be expected. The 4-hour is behaving somewhat similarly, but price could ascend above the upper band, which does appear very likely at this point, especially when we consider that the top band has already been surpassed on the hourly charts. Still, the hourly has a much smaller Bollinger band interval, so a cautionary stance is highly advisable. We may soon witness a bullish crossover of the 30-day MA above the 180-day MA. However, a drive of the 30-day MA beyond the 365-day MA, does not look to be likely, particularly in the near term, and in light of current market circumstances. VWMA is trending noticeably beyond the 30-day MA, the short-term bullish trend is reconfirmed for now, even though the 180-day MA has yet to be crossed. 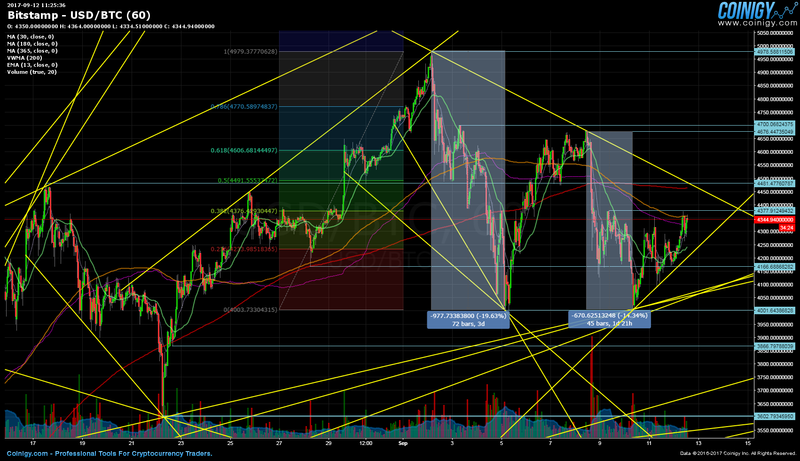 The EMA is vigorously ascending higher, affirming the previously mentioned bullish tendencies. 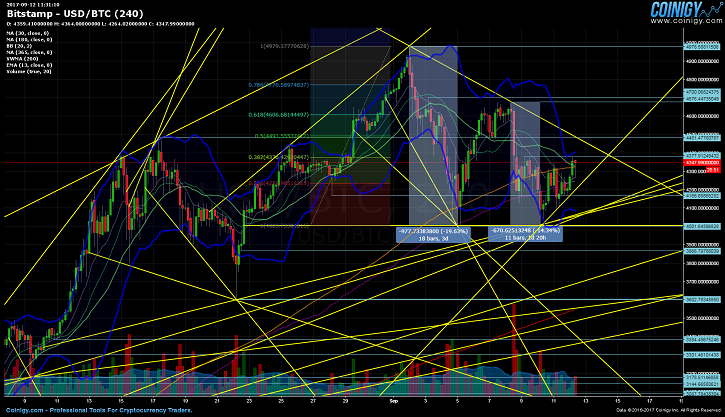 In just the past 3 days, the MACD has had 3 bullish crossovers over the signal line. The first transpired on September 10 (GMT 13:00), second on September 11 (GMT 14:00), and the third today at 02:00 GMT. Bearish crossovers, drops of the MACD below the signal line, were confined to yesterday’s trading, taking place at 05:00 GMT and 21:00 GMT. RSI is overbought, and the same is true for the %R Williams indicator. 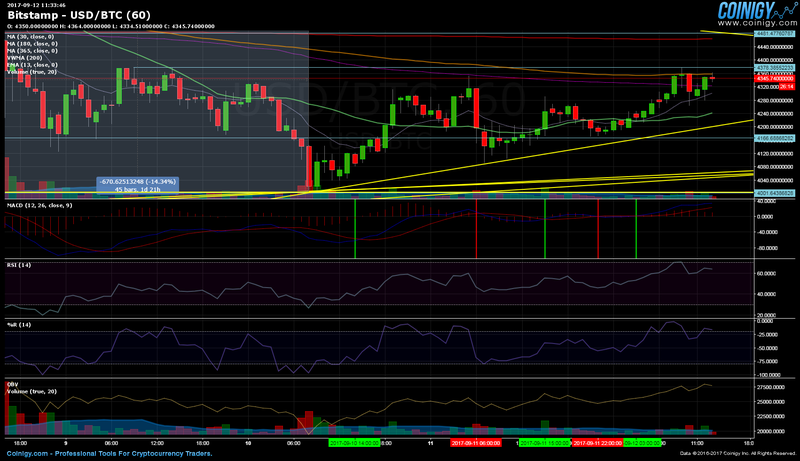 OBV has kept rising in accordance with existing price movement and momentum, no divergence for the time being. The $4,979.9 all-time high was achieved on September 2 (GMT 03:00), and it marked the beginning of a descending channel, which culminated in the $4,001.93 weekly low (GMT 03:00) on September 5. The next few days were characterized by an upswing in trading, finally resulting in price plateauing at the $4,679.97 weekly high, on September 8 (GMT 10:00). The weekly low was retested again on September 10 (GMT 08:00), but managed to hold, and the price of bitcoin has up until now, not broken past the first $4,378.38 resistance level.